7:56pm – Khloe is washing dishes. 7:33pm – Nina, Miracle, Cee-C and Teddy A are seated in the garden conversing with the latter smoking. 7:28pm – Anto is serving the housemates’ meal. 4:05pm -Head of House Tobi is reading out brief from Big Brother to the housemates. 3:09pm – Big Brother summons Head of House Tobi to the diary room. 2:57pm – The housemates are in the garden conversing. 2:02pm – Housemates in the lounge taking part in the 2018 Fifa World Cup quiz task that is being sponsored by SuperSport. 1:01pm – Head of House Tobi is reading out a task brief to his fellow housemates who are all gathered in the lounge, the task is sponsored by SuperSport and it’s about the 2018 Fifa World Cup tournament that is going to be held in Russia. 12:30pm – Tobi, Anto, Teddy A and Miracle are in the garden having a conversation. 12:18pm – Head of House Tobi reads out a task brief to his fellow housemates who are all gathered inside the lounge. 11:35am – Khloe and Nina are seated by the jacuzzi having a one on one conversation about skin and beauty regimes, Khloe seems to have some interesting tips for Nina. 11:11am – The housemates are in the garden with Teddy A smoking. 10:59am – Big Brother summons Teddy A to the diary room. 10:55am – Big Brother summons Lolu to the diary room. 10:50am – Alex joins Tobi, Anto and Miracle who are having a conversation in the bedroom. 10:40am – Tobi and Anto are in their beds having a conversation. 10:26am – Nina is cleaning and organising things in the kitchen. 10:18am – Teddy A is enjoying his breakfast meal. 10:13am – Nina is sweeping in the kitchen. 9:46am – Anto and Miracle are in the bedroom having a conversation. 9:39am – Nina is inside the bedroom making all housemates’ beds. 9:24am – Nina is sweeping in the closet room. 9:14am – Lolu is in the closet room ironing his clothes. 9:04am – Some housemates are now taking showers and cleaning themselves up. 8:57am – Big Brother orders the housemates to close the front doors of the house and remain indoors until further notice. 8:45am – Housemates are all in the garden. 8:03am – Housemates are taking part in their daily morning workout session. 7:25am – Housemates have began waking up one by one. 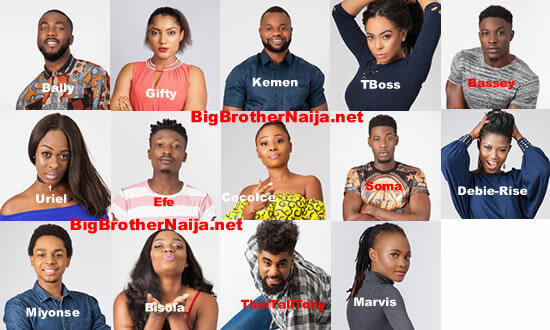 Good morning to you all and welcome to day 59 of Big Brother Naija Season 3, follow today’s Live Feed Blog for all the latest updates. You can as well check out yesterday’s highlights Here.